What is a Certified Online Business Manager? Your business growth is my WHY! I work with established and successful business owners who are ready to scale to the next level. I love distilling the complex; making your vision for growth into a strategic plan by designing the roadmap for implementation. I excel at filling the gaps to improve efficiency and cohesiveness by identifying and building the proper framework which includes systems, processes, and team! My background includes more than fifteen years of collective business experience including hands-on management of small businesses, ownership of a successful brick and mortar business, as well as reputable corporate sales and marketing experience. Because of my diversified and applicable experience, my client's business is always top of mind. I have focused specifically on the online business world for the past four years, working with dynamic entrepreneurs in varying sectors including executive coaching, non-profit management, financial planning, branding + customer experience among others. I excel at creating and cultivating lasting and meaningful relationships with my clients and their businesses. 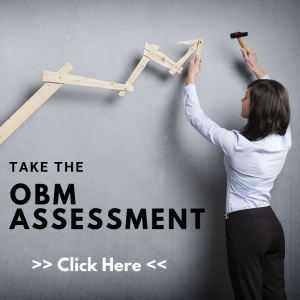 The International Association of Online Business Managers (IAOBM) is a professional membership organization dedicated to the promotion and advancement of the Certified OBM® profession worldwide. Are you ready to become an Online Business Manager?